The Max-Prop offers the possibility of pitch adjustment without external controls. 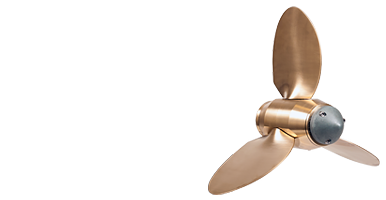 The 3, 4 or 5 blade Max-Prop is the propeller of choice for the cruising sailor. The combination of low drag, increased speed, outstanding backing power, safety and maneuvering, makes the Max-Prop the ideal cruising propeller. Max-Prop is the leading low drag propeller on the market today. Since starting production in the 1970's Max-Prop has proven itself on racing and cruising boats around the world. With over 40,000 propellers in the water, the Max-Prop is tested daily in the harshest conditions and has established itself as the most efficient and reliable low drag propeller. 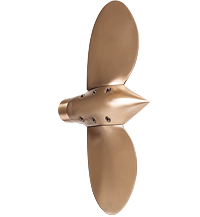 The combination of low drag, outstanding reverse power, efficient forward performance, and fail safe design makes Max-Prop the ideal sailboat propeller on the market today. Now with the introduction of the Whisper, Max-Prop has taken a large step forward in the propulsion of sailboats. Many models of Max-Prop automatic feathering propellers available so you'll be sure to find the one that fits your needs perfectly. Available from 12" to 23"
Available from 18" to 44"
Under sail a Max-Prop will increase sailing speed between 10% to 15% compared to a fixed blade propeller, the largest difference being noticed when sailing in light air. 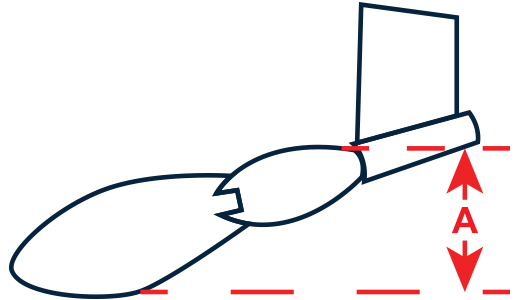 The drag under sail varies widely between propellers, number of blades, angle of the shaft as well as location of the propeller on the boat. 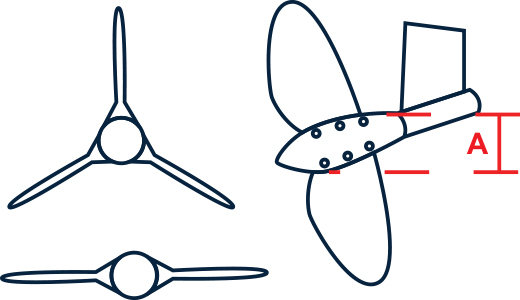 It is fair to say that a 2 blade Max-Prop propeller located on a horizontal shaft (sail-drive) will have the least drag while a 5 blade Max-Prop on a high angle shaft will have the most drag. However, even a 5 blade Max-Prop on a high angle shaft will have substantially less drag and provide more power when motoring than a fixed 2 blade propeller. In forward: the Max-Prop will offer 96% of the efficiency of a fixed blade propeller of the same diameter and pitch. The 4% loss in power can usually be eliminated by precisely matching the pitch of the Max-Prop to fit the boat engine combination. In reverse: the Max-Prop provides 80% more power than a comparable fixed blade propeller. The Max-Prop utilizes the same leading edge in forward as it does in reverse giving the propeller the same efficiency in both directions, whereas on a fixed blade propeller in reverse the trailing edge becomes the leading edge therefore reducing its power. Max-Props are "feathering propellers", so unlike folding propellers, Max-Props do not rely on centrifugal force to open. 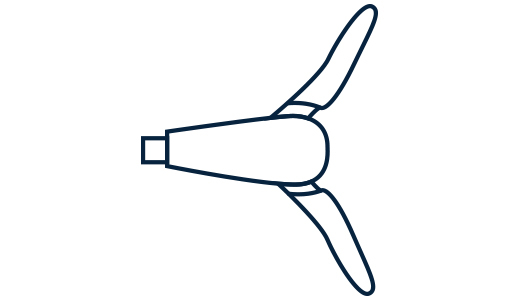 Instead, the Max-Prop relies on the torque from the shaft rotation acting on the "differential" type gear design in the body of the propeller. This in turns ensures an immediate opening in forward and more importantly in reverse, unlike folding propellers which have a lag time in reverse. The pitch setting on all Max-Prop models can be adjusted. 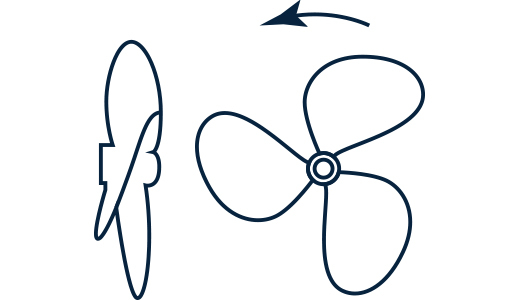 Changing the pitch is very simple; it is done by changing the setting of the gear inside the propeller with the Classic (usually upon a haul out). Or by removing a bolt and replacing with one of a different length with the Easy and Whisper. The ability to adjust the pitch will help achieve the maximum efficiency from the engine without having to purchase a new propeller. The Max-Prop will fit directly onto your existing shaft when the boat is hauled for installation. 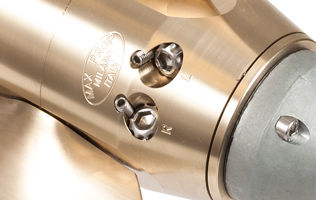 The Max-Prop will be matched to your specific shaft taper or SailDrive Spline. 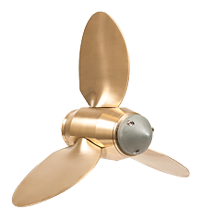 The only required maintenance is to grease the propeller once a year, and to replace anodes when they erode away. 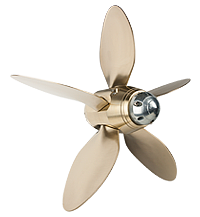 The three, four or five blade Max-Prop is the propeller of choice for the cruising sailor. The combination of low drag, increased speed under sail, outstanding backing power, safety and maneuvering, and fail safe design makes the Max-Prop the ideal cruising propeller. A Max-Prop feathers to a low drag shape. 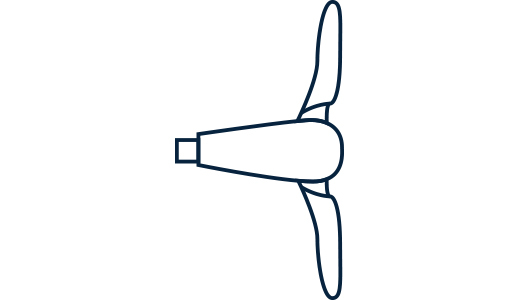 Compared to a folding propeller, the extra wetted surface of the Max-Prop blades is offset by the reduction of projected area: A. While not always exactly as efficient as a perfectly sized fixed propeller, a good choice of Max-Prop diameter, pitch and number of blades will usually achieve 96% or better efficiency compared to a fixed blade propeller. This maximum of 4% drop in efficiency is only seen at maximum throttle, which is seldom, if ever, used. 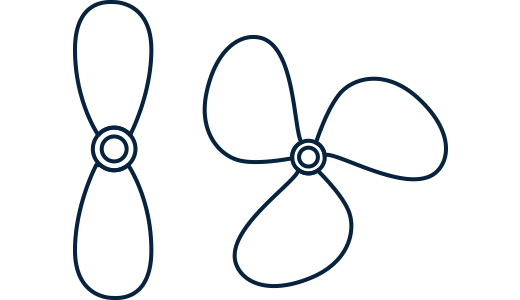 The fact that with a Max-Prop, a boat owner or a designer can choose not only the diameter and number of blades of the propeller but can also adjust the pitch easily after sea trials makes the Max-Prop an ideal tool to fine tune a boat’s performance under power. The simple fact that the Max-Prop blades use the same leading edge and pitch in reverse as in forward results in an identical power in both directions. A fixed blade propeller looses almost 50% of its power in reverse. Worse yet - a folding propeller which, depending on the brand, can loose up to 80% of its power in reverse. The Max-Prop blades switch from forward to reverse instantaneously. It takes only 3/4 of the shaft rotation for the blade switch to occur. 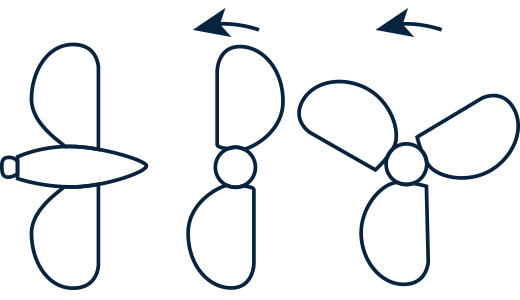 A folding propeller has low drag. The drag is directly proportional to the projected area: A. The blades will "slam" open and, if not perfectly aligned or true to each other, will cause vibration. In that the blades will not open to the maximum diameter (and occasionally not at all), the reverse power is very poor (much less than a fixed blade prop). 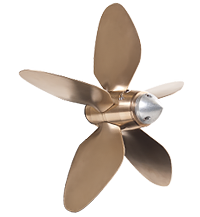 A fixed blade propeller includes a tremendous amount of drag, reducing the boats speed an average of 15%. Fixed blade propellers provide maximum efficiency as long as the pitch is correct. A fixed blade propeller works with the trailing edge as a leading edge, reducing its efficiency by 50%. Catamarans are increasingly popular modes of cruising sailboats. Catamarans in general present issues under power or sail which are different from monohull sailboats. The usual advantages of the Max-Prop are accentuated on a Catamaran. The reduced drag under sail not only improves boat speed but it also reduces turbulence over the rudders providing improved boat handling. This reduction in drag also allows a boat to come through a tack quicker and with more boat speed exiting the maneuver, making it easier to sail in light winds. With the increased beam and freeboard of a catamaran comes the downside of high windage. The impressive reverse power of the Max-Prop adds to the control and safety of the vessel when maneuvering. Max-Prop offers the options of purchasing the propeller in 2, 3, 4 or 5 blade versions. This allows the boat owner to pick the amount of power desired with a given engine, with very little trade off. Max- Prop was designed and built in the early 1970’s by Maximillian Bianchi in Milan, Italy. 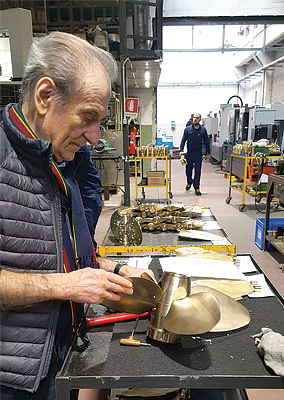 Max, a young Italian engineer invented a new type of propeller at the request of a sailboat racing friend in the golden days of the IOR racing rules. Little did he know at the time, this simple product would become his lifelong passion and livelihood. To this day, Max still oversees any new development of the product and follows it all the way through the manufacturing process. It is hard to believe, but Max quality checks each and every propeller that comes out of his factory. Nowadays, his son and daughter work with him so the legacy will continue long after Max retires (if he ever does). 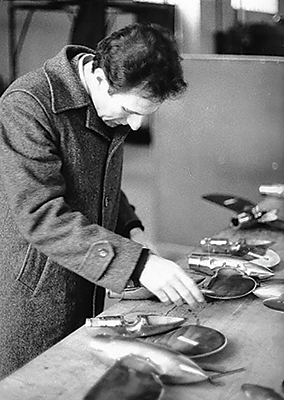 In order to keep the metal quality to a constant high standard, Max bought a foundry in the mid 70's. To this day, the majority of Max-Prop cast parts are made in that foundry close to Lake Cuomo, a two hour drive from Milan. The ownership of this foundry not only resulted in high quality cast parts, but also insured that any defect in the material or the part would not be passed on to the next stage of machining. This vertical integration is one of the main reasons for the success and durability of Max-Prop. 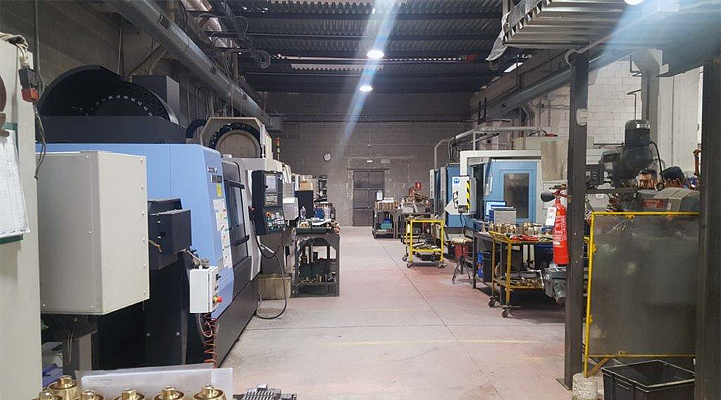 The actual machining of the propellers has always been under the full supervision of Max, from the days of manual lathes and mills to the ultra-modern CNC machines of today. 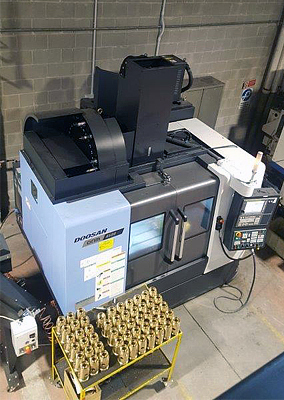 Through the years, the machine shop has had multiple locations and currently is in Milan, in the same building as the sales offices, management and where the final assembly of the Max-Prop occurs. Once again, Max himself oversees each and every process. PYI is the only sales office for Max-Prop in North/South America and Asia. PYI was established in 1981 and on that date Max-Prop was already the main product distributed. Since then, PYI has added products which are well known in the sailing community, some as a manufacturer and some as a distributor. Through the years, Max-Prop has been the driving force for PYI, allowing us to facilitate the manufacturing of other quality products. Here are common questions we receive about our Max-Props. If you can't find an answer to your question here please feel free to contact us. 1. How often should I grease the propeller? In simple terms greasing the Max-Prop once a year is perfect in most circumstances. The Max-Prop can be greased with the vessel on the hard or by a diver with the boat in the water. The more often you grease it the longer it will last, at a bare minimum it should be regreased every two years. 2. How long do the anodes last? Anodes (Zinc or Aluminum) last anywhere between two weeks to two years depending on the galvanic activity on your boat and the water around your boat. On a new installation check the Anodes often until you determine how quickly are deteriorating in your slip or mooring. I would replace the Anode with every haul-out whether it is needed or not, it is inexpensive protection for an expensive piece of equipment. 3. Is there an antifouling product that works on the Max-Prop? With regards to antifouling on the Max-Prop, there are many stories of how various household products work to keep growth off the propeller. To be honest most of them work well if you don’t use the propeller, as they create a barrier that marine growth can’t adhere to. But, the more you use the propeller the faster these and most any product will wash/wear off. The tips speeds generated by a propeller will wear the paint or coating at the tips of the blade. There is a very good product called Velox Plus, it works very well on the propeller. It costs about $150.00 for an application. While no product is perfect, it should last a season when applied correctly, but the life ultimately depend on the use the propeller gets. 4. Do I have a right or left rotating prop? The Max-Prop can be set for either right or left rotation, it does not matter to the propeller. The rotation of the shaft is determined when viewed from the stern of the vessel looking forward. 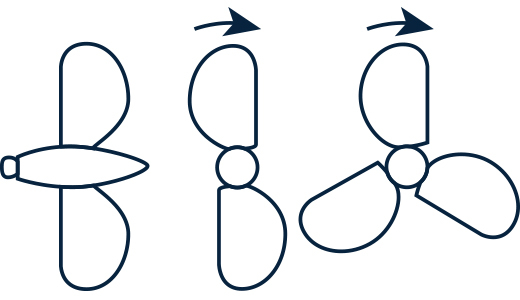 A shaft that rotates clockwise will have a right rotation propeller and a shaft that rotates Counter-clockwise will have a left hand propeller. 5. What diameter propeller do I have? For a 2 blade measure from the tip of one blade to the tip of the other, this is the diameter. For a 3, 4 or 5 blade, measure the radius, from the center of the propeller to the tip of one blade and double that number for the diameter. 6. How do I know if the pitch of my propeller is correct? 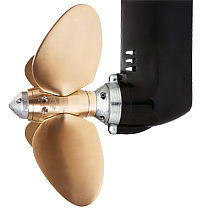 In a perfect world, while powering in flat water with a clean hull and propeller, the propeller will allow the engine to attain its maximum rated RPM. If the propeller allows the engine to attain over its maximum rated RPM then it is not creating enough load to the engine and you are not getting efficient thrust for the fuel that is being used. Conversely if the propeller does not allow the engine to attain its maximum RPM then it is overloading it and could be shortening the life of the engine. 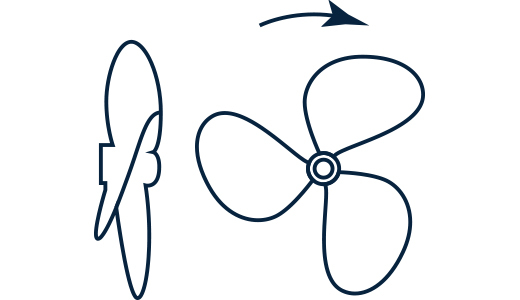 If you attain too many RPM then you will need to increase the blade angle of the propeller at your next haul-out. 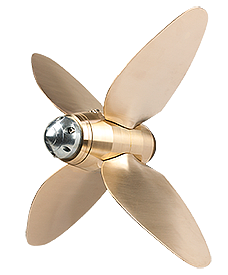 If you attain too few RPM then you will need to decrease the blade angle of the propeller. 7. What grease should I use to grease the propeller? The grease we recommend is Lubriplate 130AA. As it has been extensively tested and it performs well in all water temperatures. As an expensive alternative Lewmar winch grease performs well especially in warmer waters. 8. My engine is not reaching the max RPM, how much should I increase / decrease the pitch? To increase the maximum RPM’s that the engine can attain when powering in flat water you will need to decrease the blade angle setting. Each two degree change in blade angle will increase the maximum attainable RPM’s by about 13%. 9. Do I need a shaft zinc or is the propeller zinc enough? To a certain extent more zinc is better. The Max-Prop three blade has a zinc on it as it is often installed within an aperture where there is no room for a shaft zinc, and the propeller requires some protection. If the propeller shaft is supported by a strut it is a good idea to add an additional zinc. 10. Can the Max-Prop be serviced and repaired? Yes, the Max-Prop can be reconditioned and repaired. Whether that is normal wear, a blade bent in half, or pitting from corrosion, most damage can be repaired. To repair the propeller we will need the entire propeller, including the hub from the shaft sent to PYI Inc.
11. Can the Max-Prop be used to drive a shaft alternator or regenerate an electric motor? If you shut the engine off with the last rotation in reverse, the Max-Prop can not feather and the propeller and shaft will rotate. We can use this feature to drive a shaft alternator or regenerate an electric motor. 12. What is the correct procedure to feather my Max-Prop? Power at 2 to 3 knots in forward. Kill the engine while still engaged in forward. If your propeller has been greased properly it will feather in a fraction of a second as soon as you stop the shaft from freewheeling. DO NOT kill the engine while in reverse. In this case the blades will be held in the reverse position by the flow of the water and cannot feather. 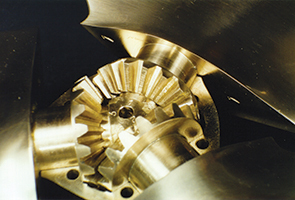 Modern transmissions are either mechanical or hydraulic. With a mechanical transmission, the best way to stop the shaft freewheeling is to engage the transmission in reverse (WARNING: engage the reverse only after the engine has stopped completely). With a hydraulic transmission you must shut off the engine while still engaged in forward. The remaining hydraulic pressure will in effect stop the shaft for a few moments, enough for the Max-Prop to feather. Want to learn more about our Max-Prop products or how to adjust or install a Max-Prop? Check out our Youtube channel for all of our videos. Download our Max-Prop catalogs, installation instructions, price lists right here.